The key to intelligent garden siting and design is to understand the geographical factors involved, and then apply them to your own situation. The photo above is from one of the most famous kitchen gardens in the world, at the Chateau Villandry, south of Paris, France. It is unlikely that any of us will ever have a garden of this scale, but it is hard not to appreciate the care and effort that went into its design. Sunlight not only provides the fuel for plant growth but as the causative factor in the creation of climate and weather, it is the backdrop for nearly every decision in siting a garden. It is the differential heating of Earth’s varies surface by the sun that causes the wind; the rough geography of mountains, valleys, plains, and lakes that makes rain, sleet and snow vary from location to location; the changing daylength, and the angle of sunlight that causes the seasons to differ vary from north to south. Thus, every factor important to the success of a garden is related to climate and geography. It used to be the only way to get solid information and weather and climate was at the library; today we have the internet, where current conditions, forecasts and historical weather records are all available at the click of a mouse. The U.S. Department of Agriculture (USDA) has taken this information and produced a map of the country that shows a series of “growing zones” based on the average minimum temperature and the average spring and fall frost dates for any location in the United States, searchable by Zipcode. Recently, a similar map was published by the American Horticultural Society that shows the same kind of data in terms of maximum temperatures. This will help gardeners in warm regions of the country plan their gardens to avoid periods of excessively high temperatures, which can be harmful to many vegetable crops. While the climatic factors that affect garden siting are important, there are three other elements to consider before you finalize a garden design: efficiency, convenience, and—let’s not forget—beauty. 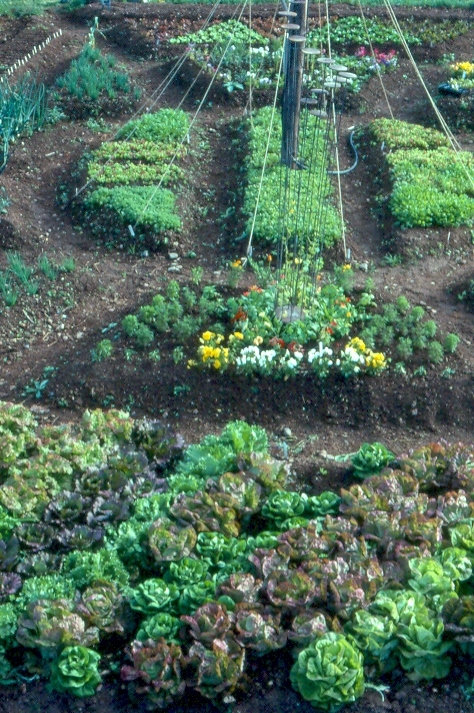 The traditional layout for kitchen gardens was established many hundreds of years ago. Called the “four-square”design, it is based on the intersection of two major paths within a symmetrical, enclosed area; in the days before irrigation it usually included a central well or spring. Many of the early examples of this traditional layout were monastic gardens, and while there were perhaps religious and symbolic reasons for the creation of this form, over the centuries its inherent efficiency has gained it a place in the secular world as well. Vegetables (and fruits and flowers and herbs) were grown in raised beds marked out by the permanent paths. The four equal-sized plots that resulted (often with smaller perimeter beds around the inside of the wall, fence, or hedge that enclosed the garden) made crop rotation and planning easy. The diversity of the plantings not only made balanced demands on the soil, but preserved the natural balance of the garden’s animal life—small mammals, insects, amphibians, and birds—an important factor in keeping pest problems under control. 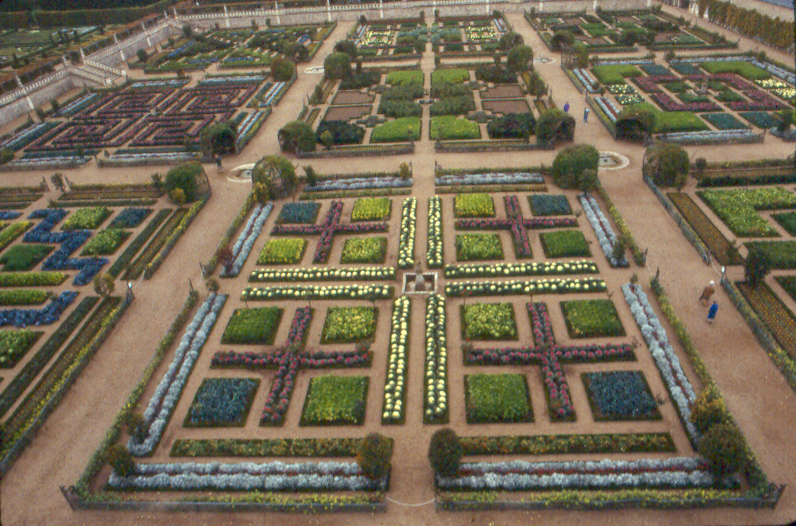 In Europe this style became highly refined as in the “potager” of Villandry. Some were eight acres or more in size, often completely surrounded by a high stone or brick wall against which tender fruits and vegetables could be grown far north of their normal range. The plantings in these gardens were quite formal, with boxwood edging the beds, and arbors at the intersection of the secondary paths trellised with espaliered fruit. American kitchen gardens have, on the whole, been much less formal. From the beginnings of colonization there has been less emphasis on strict training of the plants, but the efficiency and utility of the classic four-square layout has been largely preserved. Americans have adapted, and should continue to adapt, this traditional design to the particulars of their lives and their land. An old-fashioned garden gracing the yard of a restored Colonial-style village home in the Northeast may stick to the strict four-square design, but gardens on steeply sloped, irregularly shaped lots can be terraced into the slope and follow its contours to make the most of the conditions of the site. Hacienda gardens in the arid Southwest, as well as those nestled next to a cottonwood stream in the Midwestern prairies, can both make the most of the protection from sun and wind offered by adobe walls or tall, windbreak hedges. The basic elements, though—raised growing beds in multiple, equally sized plots, some form of enclosure and proximity to both water, and to the house of the gardener—should remain the same. What changes are merely those details that reflect regional, personal, and site-specific realities: the shape and size of the beds and the specific vegetables and varieties grown in them. Ideally each design should reflect the sensibilities and opinions of the gardener who created it, as adapted to that site.